The most important part of your new member orientation system is your member welcome package. For the Auto Training Institute, a new member welcome package contributed to longer retention, increased member lifetime value, and $1.4 million in revenue the first year it was implemented. You don’t have the opportunity to have a member for 10-months or 10-years unless you properly handle the first 10-minutes and 10-days of the relationship. Your new member welcome is the single most important part of your member relationship and, when done properly, it can earn you money each month in retained memberships. 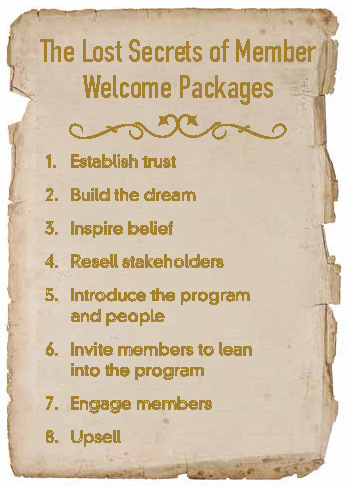 There are eight key elements needed to maximize the impact of your welcome package. In a world where Amazon.com Inc. can deliver a book, a protein bar, or a vacuum cleaner within two days, your members have little patience for anything slower from you. Your new member just input her credit card number into your website, along with all of her contact details. She expects that because she did business with you, you should appreciate her and treat her well. Even though you have a new member, you still must establish trust. Trust comes from delivering what you promise, in a timeframe the new member expects. I work with clients who take two to four days to put something into the mail for fulfillment; that’s too long. You aren’t building trust that way. You are competing with Amazon. Are you going to live up to that or systematically disappoint your new members? In order to generate a sale, your new member must have had a dream — a mental picture of how your membership program would improve their life. Too often, member marketers flip from “selling mode” before the sale to “ruthless task masters” after, telling their new member what they should do. Buying is easy, doing is hard. You must continue to build the dream your member has in his mind by explaining the transformation he’ll experience when he takes action. You may be successful in convincing your new member that your program works as promised, but your new member may still think that your program is not for him. You’ve got to give them belief. Not just belief in you and your systems, but in the belief that results are achievable. If you skip this step, you may end up with someone who loves your program but drops out because they believe it’s not for them. Selling your new member on your program is one thing, but you’ve also got to sell it to the people around him. Your new member won’t be as good at selling your program to his spouse and co-workers as you are. That’s why you must build your welcome kit to resell stakeholders. The successful implementation of your program depends on the cooperation of a spouse or fellow employees; you need to include a sales message for those audiences to get them excited as well. If there are multiple people from your company communicating with members, you need to welcome your new member with an introduction of your program and your people. Tell your new member about the people he will be speaking with and build value in those interactions so your new member is excited about the opportunity to connect with your people. Every member will experience a time when they consider quitting. It’s a natural and necessary part of learning any new skill. Swimming, tennis, and golf are all challenging to learn from the beginning. In each, there’s a point where you wonder, “Is all this frustration really worth it?” For your members, you want to invite them to lean into the program when they feel this way. Let them know the coaching, community, and/or product provide them with the support they need when they experience these feelings. Where should a new member start to get the fastest results? You build engagement by telling new members exactly what they should do to get the fastest possible results. Omitting this is like telling a 16-year-old to drive across the country without a GPS or phone. They’d get lost and frustrated. What other products and services do your members enjoy? There’s no better time to upsell additional products and services to your members. If nothing else, include a catalog of products and services for each new member. These new members are your most ready buyers. Yes, there’s a lot that should go into your new member kit, but none of these goals are difficult when you understand their role. Putting these components together in your member welcome package will grow your membership by improving your member retention, giving your program a firm foundation on which to grow.